Last weekend we met up in Nottingham, not only to eat and drink, but to record a selection of sounds for an upcoming library. The weather was perfect for a trip to East Midlands Airport where there was a great spot available to capture the planes as they came in to land. As it was our first time recording at this airport we realised that recording aeroplanes taking off was impracticable due to the motorway running perpendicular to the end of the runway. On the landing side of the runway, however, was a fairly busy road but had convenient alcoves; one of which positioned right under the flight path of aircraft coming into land. Once we parked in a nearby village and walked to the site, we unpacked our kit and set up the mics. Due to it being our first aircraft recording session (ever! ), we used these setups to compare how each one would work in the field – what setup works best and how each of them cope stereophonically with the moving source. To suppress the sound of the cars passing by and the surrounding bird tweets, we utilised the steep hillside of the alcove. This worked much better than we thought and delivered cleaner recordings without any unnatural acoustic interference. We positioned the M/S and omni setups perpendicular to the aircraft landing to obtain a smooth pass-by of the planes. The mono tracking mic was handheld and followed the aircraft as they flew over. After around ten planes in quick succession we were satisfied with the amount we captured – many more than we thought we would have the opportunity to record! The editing stage of this trip was absolutely crucial due to some of the difficulties that we had during the recording stage. The recordings turned out really well, however, due to the location we had a few things that we had no choice but to deal with during the editing stage. We now had to take care of a few major vehicle disruptions during the ‘tail’ of each sound as the plane flew overhead and descended to the runway. We also needed to attend to wildlife such as birds, and a small child that showed up halfway through the session (luckily there wasn’t a lot of shouting during the takes!). After cutting the files down, our main method of removing the artefacts was utilising Izotope’s ‘RX’. Honestly, we don’t think that we could have gone to this location without knowing the capabilities of RX. Of course, there is always a discernible limit to how much you should process audio if you want to keep it sounding as natural as possible, which is why we definitely had a few takes on the Sony PCM-M10 that went to waste due to excessively loud motorbikes/cars driving by on the tail end of the sound. We experimented a lot with RX, with most of the processes coming from the ‘Spectral Repair’ function to visually pinpoint the problem areas and resolve them with a mixture of all the processes that RX has to offer. For us it was all down to experimentation. An idea of how RX works is a plus, but even if you’re not entirely sure, just experiment with the processes. Has that function resolved the problem area? If yes, does it still sound natural? We used Waves S1 MS Matrix to decode the mid-side channels and obtain the beautiful pass bys of each aircraft. We actually edited the mid/side channels in RX before decoding the files. This was so that we could remove the bird tweets more transparently as the tweets were inherently louder in the side channel than the mid. After removing artefacts using RX we applied natural linear/log fade ins and outs to each pass by, then prepared the sounds for file naming and metadata – no dynamic/EQ processing required! We have had many discussions and have changed the way we approach file naming and metadata over the course of our previous sound libraries in the past few years. We have recently been implementing a new file naming system which we think is a lot cleaner than any of the previous versions that we have used before. So the filename now starts off with a smaller prefix but mainly the key bit of information about what the sound actually is in caps. It makes so much sense that we wish we had done it from the beginning… We’re learning from our experiences! As with file naming, there is no standardisation in terms of the layout and content of descriptive metadata for sound effects. We often use capital letters for each word, separating each word with a comma. In terms of content we don’t like to overdo it. By adding too many descriptive words could mean that the file will appear in searches way too often and probably unrelated to the search in mind, thus becoming a pest. We add in descriptive words that we would usually search for to get the required sound, also including any american terms for objects if needed. Below is a comparison of all three microphone setups for one of the aeroplane pass bys. Please feel free to download them and use within your projects. We still managed to finish up the recording session today, but our plan to release it by the end of February won’t be possible, as we are currently looking for bigger panes of glass for bigger impacts. We aren’t having much luck finding them at the moment, so if you know anywhere that have unwanted panes of glass, let us know. 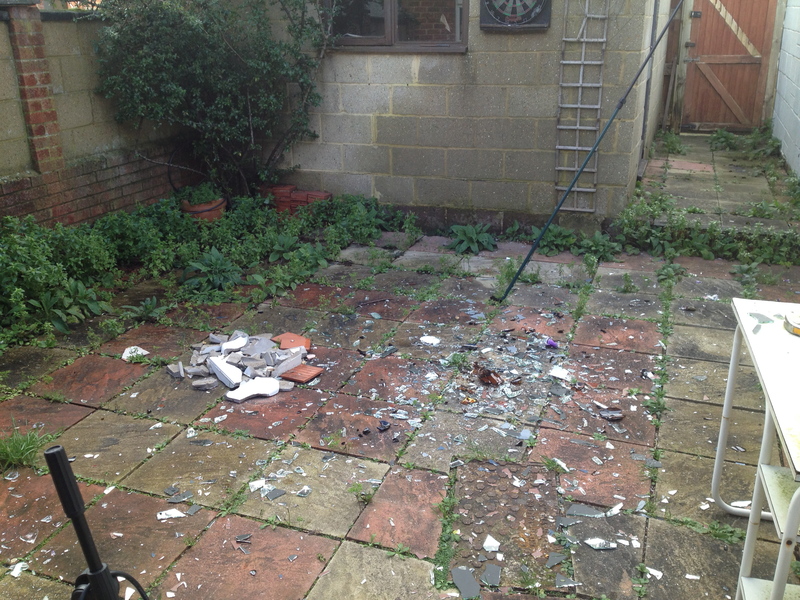 `Here is the state of our back garden after a few recording sessions for our first sound effects collection which we’re simply calling, ‘Glass’. We have tried to include as many variations of glass smashes (and sometimes not smashing) into this pack as possible, from the big smashes to small shards shattering, we hope that their will be enough variation in this pack to easily fit into any production. So far we have been recording mirrors, glass bottles, glass jars, and glass tumblers, but we will also be getting some panes of glass in soon. We are hoping to make this pack available by the end of February.